What gives YouTube a leg up among the rest is that YouTube Stories live on the channel for 7 days instead of 24 hours, giving creators the opportunity to create unique lasting content that will live on their channel for a week. Fans will have the opportunity to leave comments, respond to comments, record video responses and give a thumbs up, thumbs down or a heart. Comments on a Story will expire with the story after 7 days but uploaders will be able to see comments on expired Stories for 30 days in YouTube Studio. YouTube Stories will feature the same comment moderation tools as video uploads on the site allowing you to remove, report or hide comments as desired. Google recently shared that with machine learning, their AR technology is able to capture more light, depth and movement. As displayed in filters on YouTube Stories, augmentations like makeup and other effects will appear more detailed and lag less than other applications that use AR filters, allowing users to dance, shimmy and shake their way around the screen without losing their glow. If a viewer who isn’t subscribed to your channel is watching your story, they can subscribe directly from the story. You can ask your audience questions, giving power to their opinion on important topics or decisions, which could ultimately save you time, money and energy. It’s also a great way to engage your fans and make them part of the story! Make important announcements about new videos, tours, and upcoming projects to direct your fans to your latest content. In return, this can help increase sales and gain traffic across your channel. The platform is more casual but appeals to an audience eager for video content. Short clips allow you to share thoughts on a broader set of topics that you wouldn’t necessarily elaborate on using a full-length or higher quality video. 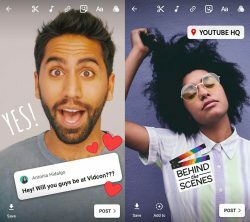 Digital storytelling is here to stay and with YouTube Stories, you’re now able to connect with your viewers in a personal, in-the-moment way. The Stories feature is now available on mobile in beta for channels with over 10,000 subscribers. You can find more information about YouTube Stories in YouTube Help Center.